Today, I want to educate you about what I think is the perfect first business. Please keep in mind that this is just my opinion, based off 13 years experience as an entrepreneur. I should start out by telling you there are lots of business models and types of businesses to choose from. Ultimately, you could succeed or fail in ANY business or business model that you choose. There is no guarantee of success as a business owner. Most businesses fail. Depending on which source you cite, nearly 9 out of 10 businesses fail in their first 10 years. What holds most people back from starting their own business is the UPFRONT money it takes to get started. Most traditional businesses cost anywhere from $10k to $100k (or more) just to get started. This doesn’t count the ongoing monthly overhead either. Most people don’t have that type of money to invest, nor can they get the financing. A second thing that holds most people back from starting a business is giving up their job security and steady paycheck. We have all been led to believe that job security and a steady paycheck is BETTER than the unknown of starting your own business. Very few people will walk away from a comfortable paycheck to start their own business, even if they have the desire to do so. I’ve looked at a lot of business models myself during the past 13 years and I truly believe that network marketing is the perfect first business. Now, before you turn up your nose and hit the back button to leave this webpage, let me tell you WHY I think that. 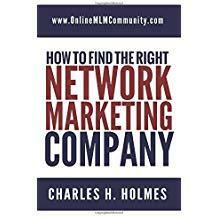 First off, MLM is VERY inexpensive to get started with. Most network marketing companies cost less than $100 to get started. Some are even free to join. This fits most people’s budget. When compared to the start up costs of a traditional business, this is a no brainer. In addition, MLM offers great entrepreneurship training. You learn about sales, marketing, taxes, recruiting, lead generation, communication, operations, leadership, and so much more. You learn my doing. You learn real world principles, not theory. This “education” will serve you very well in future business endeavors. To be quite frank with you, I think MLM is the best business school on this planet and it’s my # 1 reason to get involved. Another reason I think MLM is the perfect business is the small ongoing monthly overhead. You do not need employees or a separate office. You do not need inventory, extra insurance or extra utilities. In most cases, you can operate your business for less than $100 per month. Try doing that with any other type of business! Another great thing about network marketing is that it’s designed to do part-time in the beginning. That means you can keep your day job and steady paycheck while you get started. You can set your own hours of operation. You can keep the financial pressure off your back while you learn the ropes. You don’t have to give up you financial security to start your business. Another reason why network marketing is the perfect first business is because you get LEVERAGE. Most traditional business owners are a slave to their business. In other words, they are the business. The day they stop working is the day they stop getting paid. With network marketing you can leverage other people, without having employees or tons of cash. You can build a team of hundreds, or thousands of people, and earn a small commission from each person. That’s a lot better than only getting paid on your own efforts. Another reason why network marketing is the perfect first business is that you get a free mentor. In the traditional business world, when you teach someone everything you know, they become your competitor. Not so in network marketing. This is one of the few business models I know of where you get a successful mentor, free of charge, who WANTS to help you succeed. In summary, these are just a few reasons why I think network marketing is the perfect first business. No, the industry isn’t perfect. No, it isn’t easy. But the risk/reward factor is in your favor. Best of all, you can get started for a very low cost, keep your day job, work part time, have leverage, and learn how to be an entrepreneur at the same time. I think it’s the best of both worlds. What about you? What do you think is the perfect first business? Leave a comment below to share your thoughts. I look forward to hearing from you. I think you make some great points about MLM being a good starter business. However, depending on the product or service, finding a local market can be difficult. The perfect first business is something you are passionate about and already has an established market of people buying what you are selling. You have to love it first and foremost. If you can find a MLM that you can really believe in and it is solving a problem or meeting a need then I say go for it. Yes, you definitely want to be passionate about the products and business if you expect to do well. There is no common sense argument against anything you said here. A traditional business will cost a lot of money to start, and you will be working many more hours than a regular job if you want success. The one thing I will say is: make sure you choose the right network marketing business for you. Don’t be pressured by hype; research and study the MLM you plan on joining. Make sure the products or services are something you will be proud to sell, as that is the most important. If you don’t like the products or services, why would you want to be a part of selling them? Yes, I agree. The perfect first business is network marketing.